Bird Vet - Chicken Friendly Hospital. Removes all metallic and shiny objects from the ground were hens forage. To prevent heavy metal toxicity and foreign body problems. Either test droppings or treat your hens approximately every 2 months with the following tree medications, wormer, Cocci, mile and lice spray. Diet - egg laying hen’s need an egg laying ration as a starting point, as there is a very high calcium and protein need to produce the "miracle" egg! Fox proof the chicken home. Protect your hens from the cold in winter - a wind proof, warm roosting area in winter. Can insulate the area with bubble wrap. Jumpers if there are lots of body feathers lost or in temperatures are less than 10 degrees. In summer provide shade and COLD water to drink. Add an ice block to the water on cold days. Hens enjoy 1 on 1 human cuddling – if they feel safe! Get chicken nappies - or make a chicken nappy and bring the hens indoors to play. Chickens are so intelligent and easy to train, and have unique personalities. 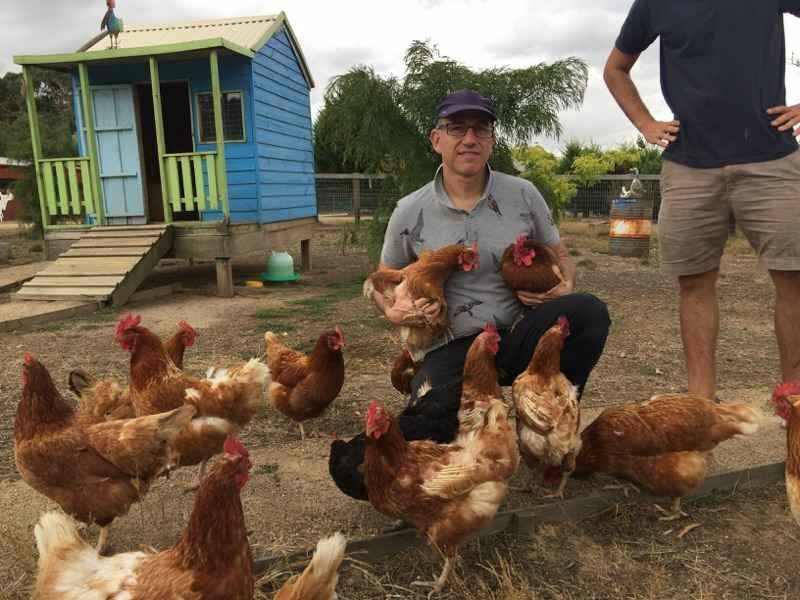 The chicken vet hospital patients enjoying the grass in the security of the outdoor enclosures that any good chicken vet facility would have - like Bird Vet Melbourne.